Offerings get more sophisticated and better integrated with financing. The much-anticipated world of business presenting and viewing invoices online and paying them to each other electronically has been much slower to develop than many analysts’ initial rosy estimates. The dotcom crash, the failure of many business-to-business online exchanges, adverse business and economic conditions and a lack of standards between various invoice and accounts payable and billable systems have all played roles in the slow adoption. But now, three years after the Internet bubble burst, electronic invoice presentment and payment (EIPP) is starting to catch on and deliver real benefits in processing efficiency. Analysts see the growth of business payments online picking up. By 2006 about 40% of businessto- business payments by large US-based companies will be made electronically, according to Gartner, a Stamford, Connecticut-based research and consulting firm. That’s more than double the current rate of adoption. 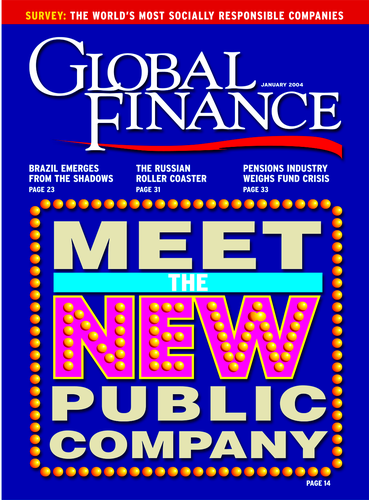 Companies processing invoices online are benefiting from decreased invoice handling costs, more efficient payment routing approval processes, reduced printing and postage costs, a lower overall cost of payment, faster dispute resolution, and in some cases accelerated cash flows.The newer EIPP product offerings are being better linked with financing, say e-billing providers. 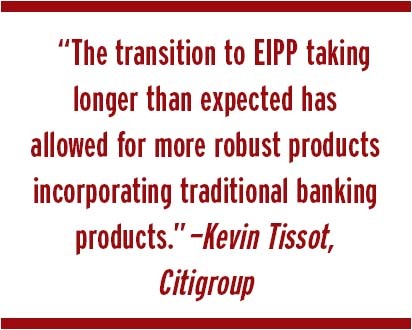 “The transition to EIPP taking longer than expected has allowed for more robust products incorporating traditional banking products,” says Kevin Tissot, vice president in global cash management at Citigroup and responsible for the global banking giant’s North American e-billing services. For example, Citigroup in Europe has incorporated its cash management netting service in the EIPP product it provides clients. It also plans do so in North America soon. Putting the billing and payment process online makes it easier to see and address cash flow and financing needs, say EIPP vendors.“Once you’ve made it electronic, now you have tremendous visibility into the working capital needs of the business,and that’s where the banks will continue to be players,” says Todd Barnhart, senior vice president in sales and marketing at San Francisco-based Velosant,which includes the BillingZone EIPP service and is one the three biggest service providers in this emerging industry.“EIPP is a step in the process of automating the financial supply chain,” he notes. Barnhart explains that it has become common for sellers to offer 2% discounts to buyers if they pay in 10 days instead of the traditional 30.This has opened up a lucrative opportunity for banks to provide financing to buyers to meet the early payment deadlines. Banks are also helping sellers to obtain financing against their accounts re- ceivable (a process called factoring) electronically. 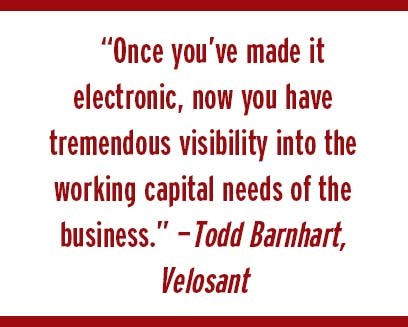 Velosant, a subsidiary of First Data Corp., has EIPP partnerships with ABN AMRO, Key Bank, PNC Bank, National City and Wachovia. Numbers are difficult to come by to quantify just how much invoicing and payment businesses are conducting online. A check of the leading players in EIPP (such as Velosant; Montreal-based BCE Emergis; Pleasanton, California- based Xign; Citigroup; and Portsmouth, New Hampshire- based Bottomline Technologies) finds that nobody has more than a few dozen corporate customers. One company that is illustrative of what is happening in business e-billing is Cargo Network Services (CNS), a subsidiary of the International Air Transport Association. CNS serves the US air cargo industry, including administering an industry settlement system, called the Cargo Agent Settlement System (CASS). Before it went online, CNS used to print out thousands of invoices every two weeks and mail them out to settle the transactions between the airlines that carry cargo and the agents that ship it on behalf of business clients.The approach was inefficient, getting increasingly expensive, and making it difficult to track the status of invoices and to settle disputes, says Howard Chaloner, director of operations and financial services at CNS, which has its executive offices in Garden City, New York. In April 2003 CNS went live with its CASS USA e-billing system, facilitated by Citigroup. CNS has 70 of its 80 member cargo airlines participating in its EIPP system. It hopes to add Singapore Airlines Cargo in 2004, says Chaloner. He says that the main benefit for participating airlines has been accelerated cash flow. “Many airlines have said their cash flow has improved by six or seven days,” he notes. Chaloner says that CNS’s 1,200 freight forwarders and cargo agents (which are like travel agents for cargo) have benefited from improved employee productivity because of a reduced paper trail. CNS settles about $2 billion in invoices annually, with 95% to 98% now being processed online. About $100 million in invoices per month (or $1.2 billion annually) are being paid electronically, says Chaloner. Under the old system, 99% of payments were made by check. The way the e-billing system has helped both the airlines and cargo agents of CNS is in the settlement of disputes. Both sides of a transaction can view invoices online and make adjustments provided they submit information to back up their claims,explains Chaloner.“Now it’s all online, all visible and transparent,” he says. CNS has built in time limits for making those adjustments. The bottom line is that the whole dispute resolution cycle has been cut to 90 days. It could drag on for as much as six to nine months under the paper-based system, says Chaloner. Another key trend that is gradually pushing e-billing adoption rates up is the shift of focus toward the buyer, or the accounts payable side of the business. E-billing got its start three to four years ago with products geared toward large billers and the accounts billable process. EIPP analysts and company officials say that buyers are uniquely positioned to push adoption of electronic invoicing because they hold the leverage over sellers and can mandate that they do business online. EIPP vendors and their bank partners are rolling out new product suites that are geared toward helping companies who deal with lots of suppliers.With these new offerings and the push to wring efficiencies from accounts payable, large companies such as General Electric are increasingly demanding that their suppliers send them invoices only over the Internet.